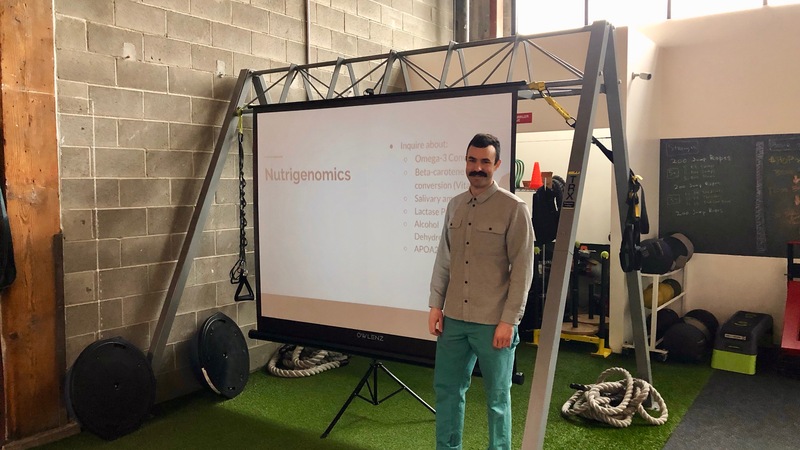 On February 3, Dustin Millhollen opened our annual speaker series with a presentation highlighting the important elements of a well-rounded, sustainable approach to nutrition including what to eat before and after a workout, the essential elements of a properly composed meal or snack and a look at some of the different diet protocols. Many of our members wanted to learn from Dustin, but were unable to be at the studio that morning. We recorded the presentation on video and have posted it here. This video is around 1 hour and 15 minutes. Bear with us, this is our first video creation, and trust that Dustin steps back into the frame before too long. :) Dustin has also made public his slides. You can open them in google slides with this link. Dustin Millhollen is a personal trainer and nutritionist at Hyatt Training. He holds an MS in Nutrition from National University of Natural Medicine and a CSCS from the National Strength and Conditioning Association. Learn more about Dustin, or get in touch with him by emailing us at Go@HyattTraining.com.